Tired of oatmeal porridge for breakfast? Change it up with these oatmeal cinnamon apple pancakes or use chickpea flour to add a punch of protein to your morning routine. Top the pancakes with cinnamon apples and nut or seed butter for a healthy, wholesome breakfast. *To make oat flour, blend oats in a high-speed blender. In a bowl, combine the flour with baking powder and cinnamon. In a separate bowl, combine the water, applesauce, and vanilla. Then pour the mixture into the bowl with the flour. Stir until well-combined. Warm a pan on low heat. Option to boil water in the pan on high-heat, discard the water, and then reduce to low heat. You want to make sure the pan is warm enough for the pancakes to cook right. Measure 2-3 Tablespoons of batter and pour on to the pan. Cook for a few minutes on low heat, then flip and cook on the other side. Continue this process until the batter is gone. To make the apple topping, chop the apples and dates. Place the apples and dates in a pan with a 1-2 tablespoons of water. Cook until the apples start to break down, then add in the cinnamon. Continue to add small amounts of water, as needed to keep cooking. 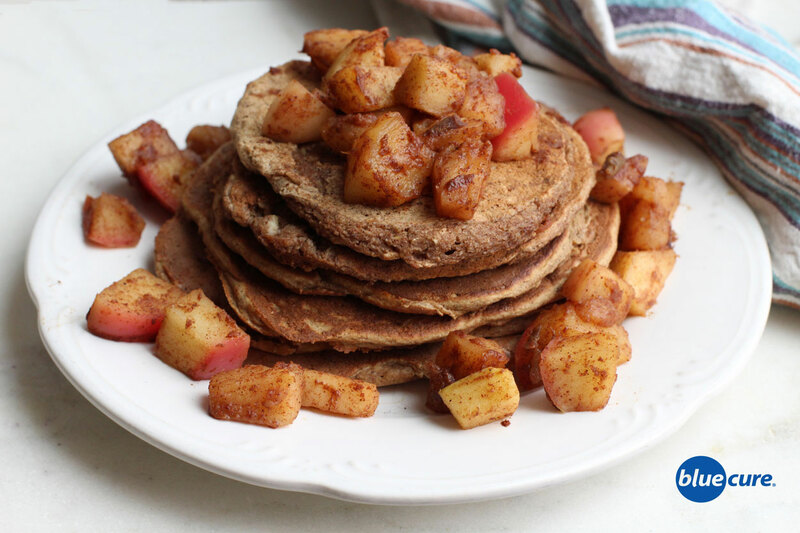 Top the pancakes with nut or seed butter of choice and the cinnamon apple topping.